At the heart of D3M is your projects. When you first open D3M you will see a list of all the projects you have access to, including the projects you have created and those that have been shared with you. Here you can find the project you need using search and filters or create a new one using the orange button at the top left. 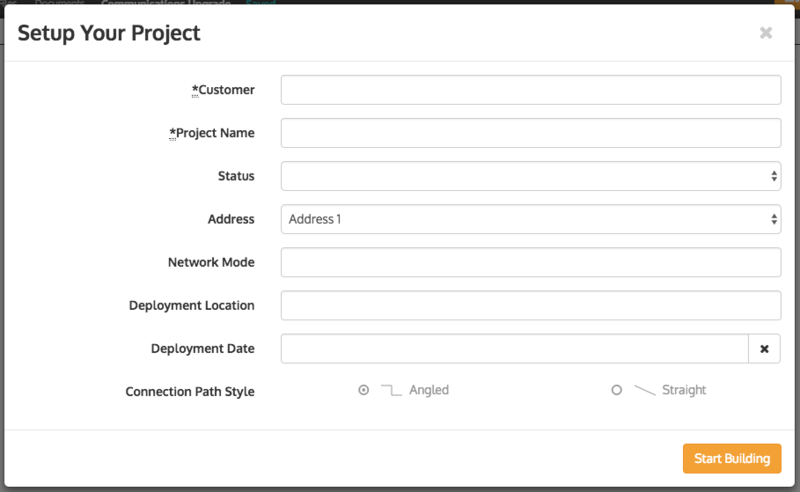 When you create a new project you are presented with a form to fill out some basic project settings and information, the most important being the Customer and Project Name. You can access and edit this information at any time by clicking the cog icon, available both on the projects list and on the top bar when inside a project. When you open a new project, you see a blank canvas where you can begin to design a solution for your customer. 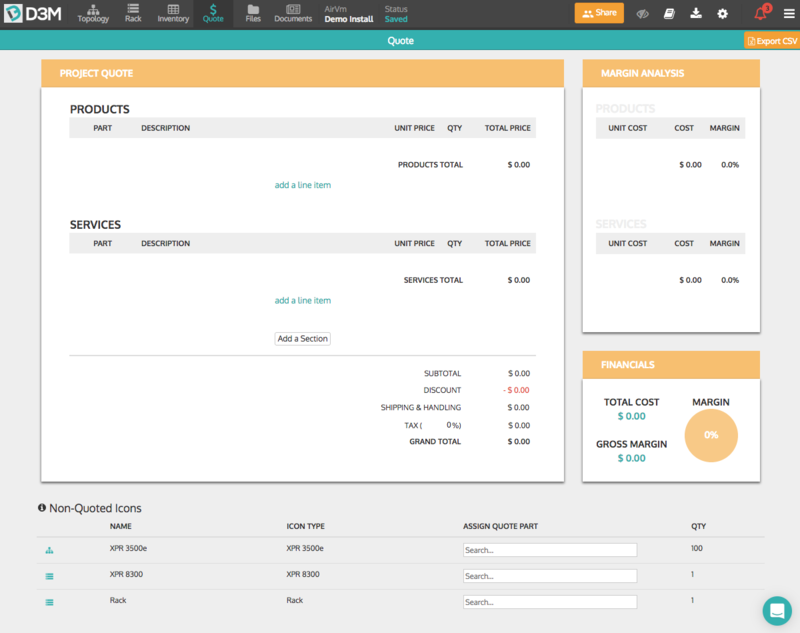 As we navigate through the project, you will want to use the navigation at the top of the page. In the Topology diagram, use the library of icons on the left to drag out devices onto your canvas. To connect those devices, click the "Ports" button on the top right. Each device has a configuration of ports that are different types. Click and drag from a dark grey box to create a link to a device with a compatible port. 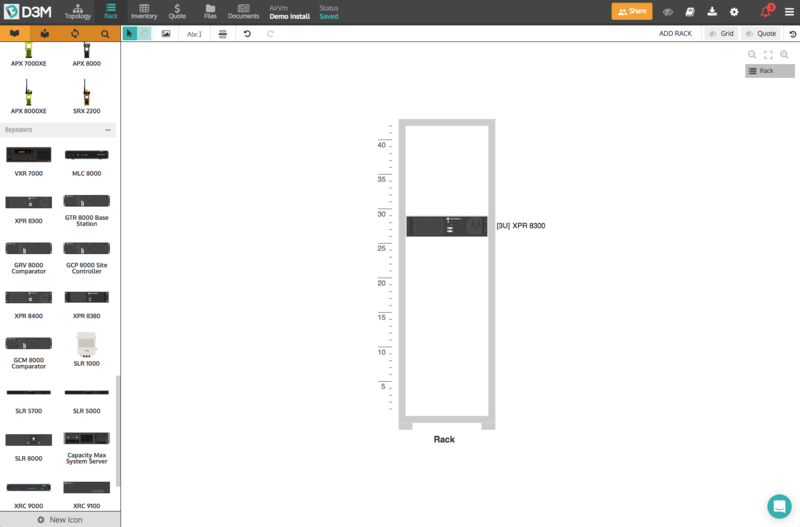 You can also create Rack diagrams to document how devices will be organized into racks. Use the "ADD RACK" button in the top right to add one or more racks. Then, just like in the topology, drag items out of the library on the left into a rack. When in a diagram, you can always double-click on a device to view and edit the information related to that device. You can also see all your devices in a tabular format in the Inventory view. Click a device type on the left to see all the related devices in the table. Click a cell in the table and start typing to fill in additional information, which will be synced back to your diagram. When preparing a quote, you can see all the devices that have not yet been added to the quote at the very bottom. Type in the input to search for a part number or name of a device, then select the correct quote part from the dropdown. A line will be added to your quote in the Products section. You can also use the buttons in the quote to add a custom line item, add a new section, or apply discounts, shipping, tax, etc... Also notice that you will see a margin analysis along the right as you build out your quote. 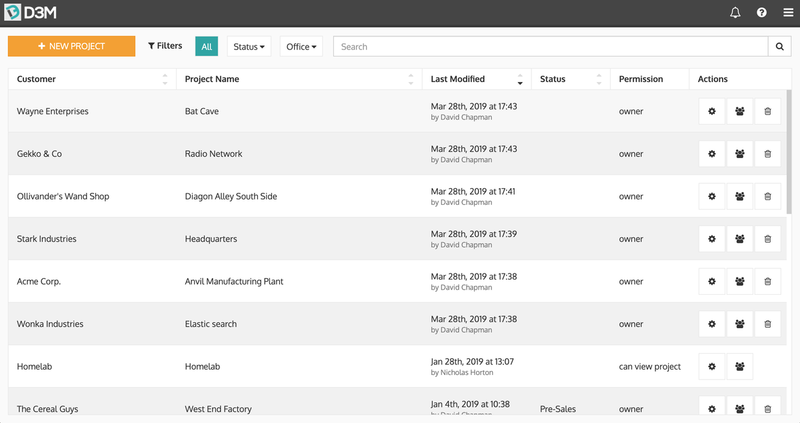 The files view allows you to attach external files to your project and organize them into folders. Create folders and upload files by clicking the buttons in the toolbar. 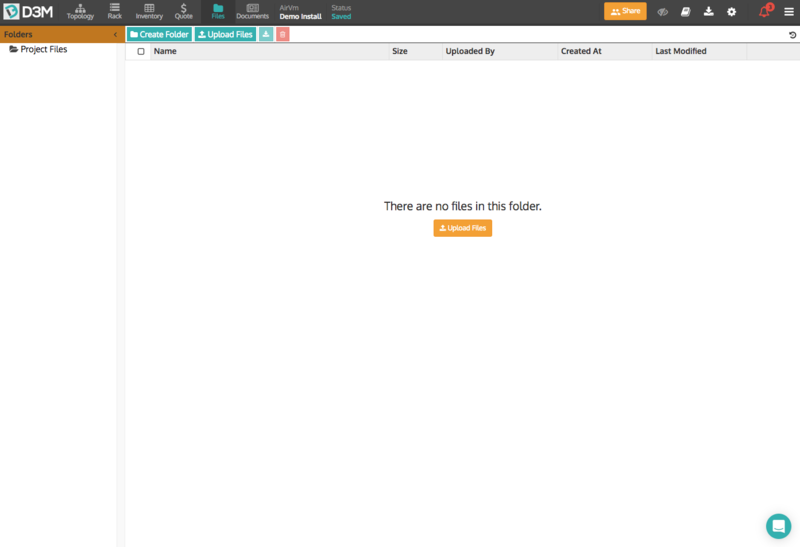 Navigate your folders using the tree on the left (empty shown below). Use documents to bring together your Topology, Rack, Inventory, and Quote into a single document that can be shared with your customer. 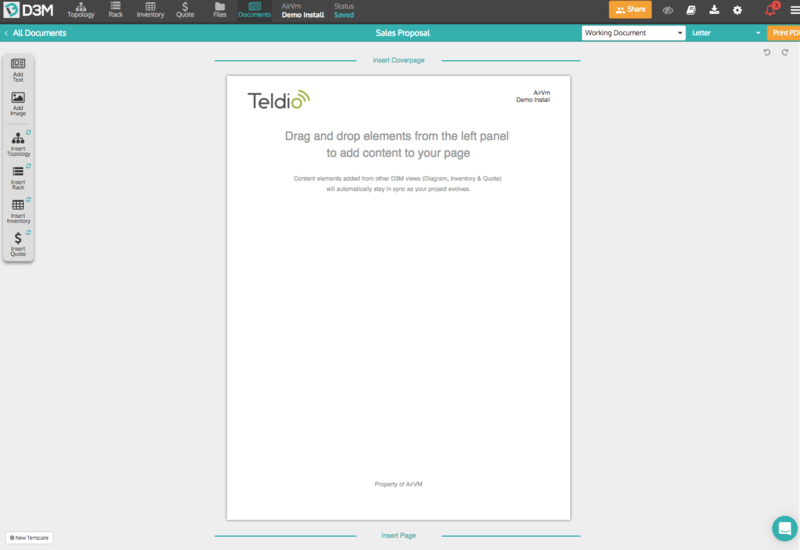 Click to create a new document and select from the available templates. Once in your new document, you can add a coverpage or new blank pages by using the buttons above and below each page. Add content by dragging types of content from the left. 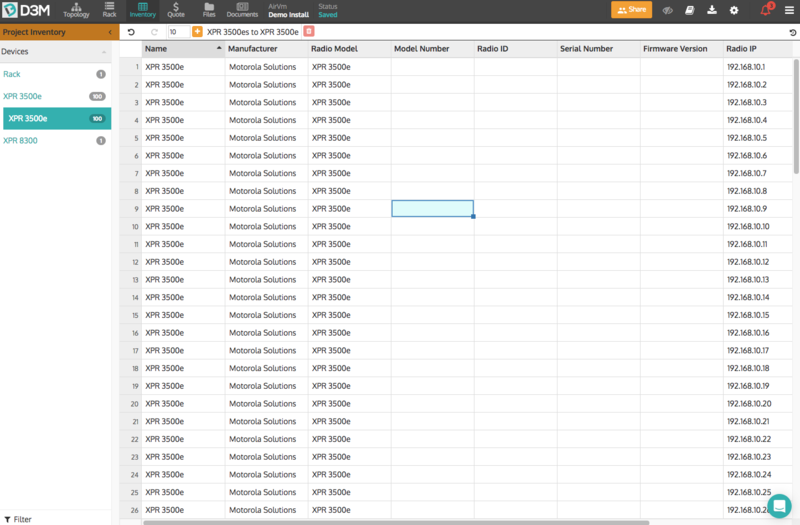 Choose from static types, such as text and images, or dynamic types, such as diagrams, inventory lists, and quotes. Once you have a document ready to share with your customer, you can do so using the Export/Share button at the top right. Clicking it will reveal options to download a PDF, copy and link that you can send to your customer, or input your customer's email and D3M will send an email on your behalf giving your customer a personal link showing you when they have accessed the document. Finally, you can share the entire project with other D3M users (usually colleagues) by clicking the "Collaborate" button at the top of the screen. You can grant view, edit, or share privileges to specific D3M users or to your entire organization. Any users that are in the same project at the same time will see notifications of presence and live updates of their colleagues work. Each section of a project has many advanced features to help make you more efficient. Check out our other articles to get more information.